Last month, Connie put 2 homes into escrow in a single day! And it’s quite the story. 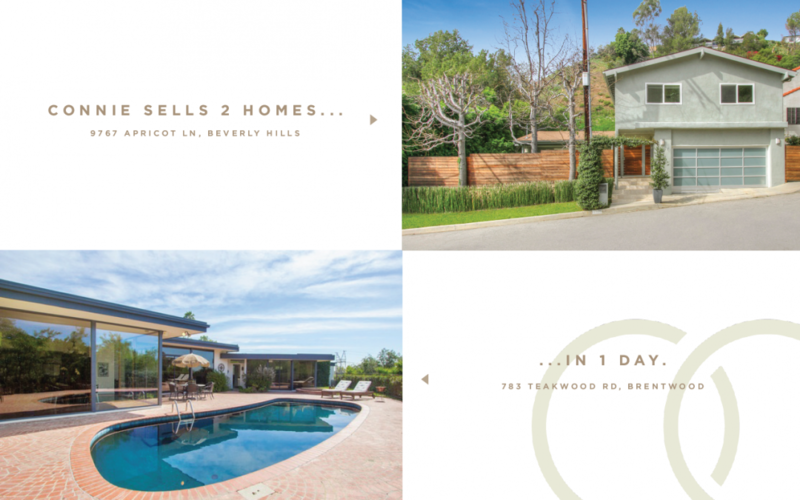 Within just a few weeks of listing her clients’ home on Apricot Lane in Beverly Hills, Connie put the home into escrow. In turn, the clients gave her one day to find them a new home – on Easter Sunday, no less! With her trademark determination, Connie found a very special home for them on Teakwood Road in Brentwood, and begged the owners for a showing that same day. Connie’s clients fell in love right away, and insisted she close the deal that afternoon – again, on Easter Sunday! Nonetheless, Connie was not only able to get acceptance on a holiday, but did so within 3 hours. That’s Connie: No nonsense. Just results. If you want a winner in your corner, give Connie a ring!